1 unit of steam is produced for each unit of water. A single unit of coal (4MJ) fed into a boiler and then utilised in a steam engine will result in 4MJ of energy added to an electrical system. It costs 30kJ energy to heat 1 unit of water to steam at 165°C, so one boiler will produce 60 steam per second. Boilers are the main source of pollution in the early and midgame. Inserters can place (fuel) items into boilers, but can also remove items from them. See this post and follow ups. Changed boiler dimensions to 3×2. 'Steam' is produced on a separate connector rather than heating water passed through. At this time, steam is actually water that is renamed when over 100 degrees. New fire graphics for boilers. Enabled the inserter to take fuel out of boilers. Flickering light added to furnaces and boilers. Boilers show their fuel inventory in the entity info. 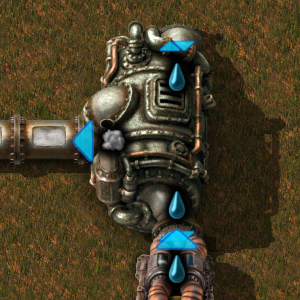 Boilers are now fast-replaceable with pipes.